I have a Master’s degree in Elementary Reading and Literacy. I feel pretty confident in teaching reading and phonics. Where I lack confidence is in math instruction. I try my best to make it hands on and to give the students meaningful experiences, but I must confess that I lack some knowledge in the theories of math instruction. I’ve purchased several resources lately to try to help me learn to be a better math teacher. One of those resources is Jessica Shumway’s book Number Sense Routines. The Queen visits the kids each 10th day of school and has a Ten Wand made of 5 blue and 5 green unifix cubes. She’s very clumsy and always seems to break her wand. The kiddos have to look at how many cubes are in her hand and figure out how many cubes she dropped, then create a number sentence. As this routine progresses throughout the year, students gain a great mastery of sums of 10 and an understanding of the commutative property of addition. They can also gain an understanding of missing addends. 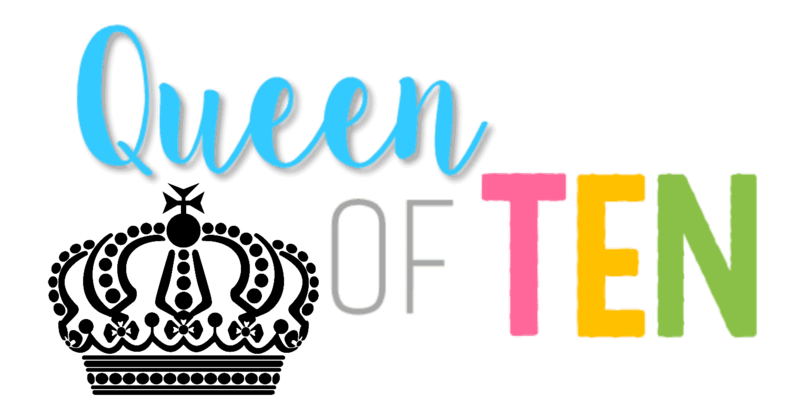 I’ve created several resources to use along with the story of the Queen of Ten. 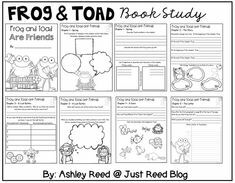 Since the Queen is not my idea (but the resources were), I’ve included them as a free download! There are pages for students to color and record some of the various combinations that make 10 as the Queen breaks her wand. 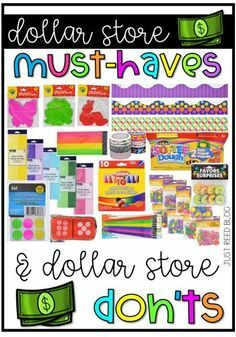 Also included are color flashcards to use as you determine various ways to make 10. You could also have students use unifix cubes to recreate the scenarios on the cards. 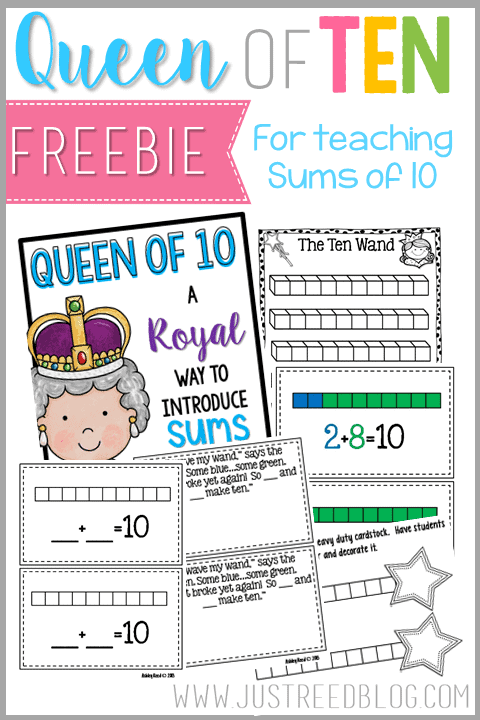 Students can make their own Queen of 10 booklets that demonstrate the various combinations of ten. I wrote a catchy little jingle. 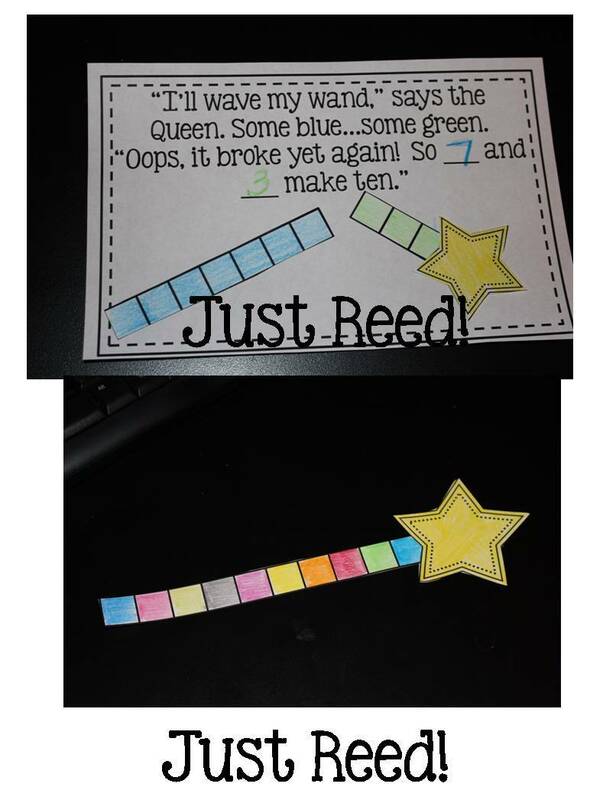 Students will color and “break apart” a ten wand to make a sums of 10 scenario. 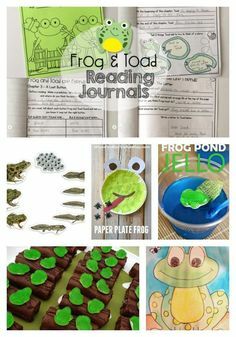 Students can use the wand template I’ve included…or you can cut out green and blue squares of construction paper for them to make their wands out of! Just be sure each wand has exactly ten blocks. 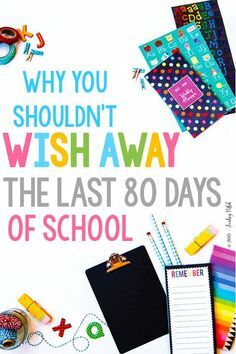 These would make a great class book. 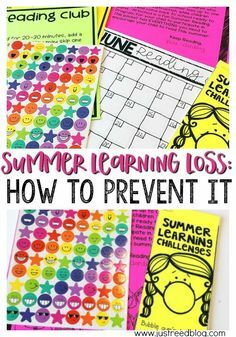 I hope you enjoy using this freebie with your students! Be sure to follow my Math Board on Pinterest for more inspiration! Follow Ashley @ Just Reed Blog’s board I Got Yo Number! 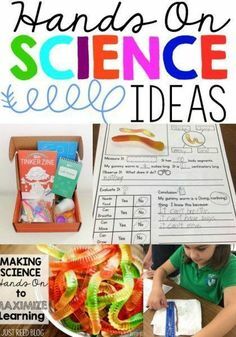 Math Ideas on Pinterest. Thanks for the wonderful resource!!! 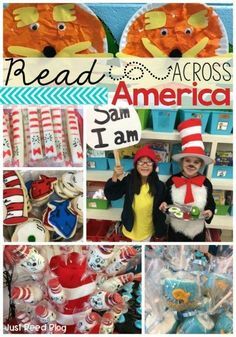 What an adorable way to teach the 10's family!! I love the poem! Thanks Ashley! Ashley, this is so great! Thanks! This is super! 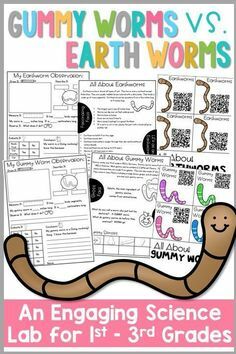 Thank you so much for taking the idea and presenting it in a fun way for my first graders. Can't wait to use this!